If you're eating a healthy raw food diet and looking for something good to put on a salad, this isn't a bad place to start. To make this recipe you'll need either a blender which can chop, pulse or grind food, or a food processor. Theoretically you could make it by hand, but it would take a lot of chopping. The recipe is very forgiving of variations, so feel free to experiment as your taste buds demand. For instance, adding more celery can turn it into something very interesting and salty, but quite different. If you want it less liquidy and more slawish, cut back on the tomatoes. Many of you know that I'm not a big fan of eating lots of dehydrated food. I think a solid argument can be made that food is not ideal once the water has been removed. In this recipe, however, I didn't come close to fully dehydrating the tomatoes. I used a friend's machine to pull 10 to 15 percent of the liquid from them, intensifying the flavor in a very pleasant way. Obviously, the more liquid you pull out, the more rich the slaw will be. I don't think this is a big deal if it's an occasional indulgence. (Optional) One to two hours before you want to make the recipe, chop up the tomatoes and place them in the dehydrator. Place your tomatoes, celery, herbs, avocado, and corn into your food processor or blender and process it until it's of a rough, well-blended consistency. Eat it straight or add it to your salad as a dressing. 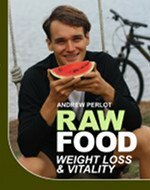 Find other delicious raw recipes. 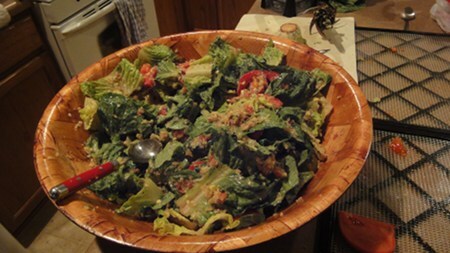 Want to spice up your salads a bit while keeping them healthy? 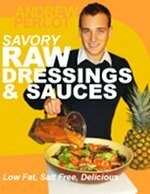 Take them to the next level with Savory Raw Dressings And Sauces.